Christians who know and believe the Bible are well aware that Satan exists, and is intent on negating or even destroying the work of God. Some professing Christians see the devil behind every bush, and blame him for practically everything that goes wrong. That's not the whole story. Scripture tells us that we have two other sources of conflict: the flesh and the world. 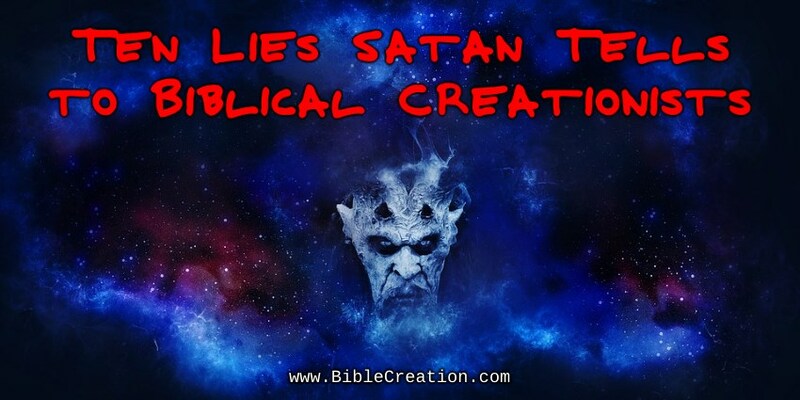 Satan will not only use his own deceitful skills, but brings the other two nonentities along to bring down a believer. In addition, we have our own lusts and sin nature, so we may very well be out of line to blame Satan too often. The opposite extreme is to take a pseudo-intellectual approach and pretend that Satan does not exist. A phrase attributed to French writer Charles Baudelaire has appeared in several forms and in many places, including movies: "The devil's finest trick is to persuade you that he does not exist." I'll let you study on that for a while and you can see why it would be very useful for the devil to be unacknowledged. So, as in many other cases, there has to be balance. The devil exists, and wants to destroy us (1 Peter 5:8). Look way back at the beginning. Satan appealed to Eve on several levels in Genesis 3:6, and her own desires helped his temptation along. I need to add that Satan is not the scary, ugly thing depicted in comic books, movies, poetry, art, the image shown below, and so forth. He is actually quite beautiful (Ezekiel 28:13-17, Isaiah 14:12-14, 2 Corinthians 11:14-15). Satan is attractive to us, which is part of the reason he is so effective. I said all that to make it clear that this is not a treatise on spiritual warfare per se, and I hope it will be useful to the clear-thinking Christian. A while back, Charlie Wolcott recommended a couple of sermons by Eric Ludy, and one that stood out for me was "The Nine Lies" that Satan told to Nehemiah through owlhoots that were riding for the anti-Israel brand. I am highlighting this message for Question Evolution Day, and it is useful for biblical creationists as well as Christians in general. Clever folks probably noticed that Eric has nine lies, but my title adds a tenth lie. I am going to draw from my own experiences in biblical creation science ministry efforts, especially The Question Evolution Project. Note that I am unaware of Mr. Ludy's views on creation, and not giving a blanket endorsement of his site, just the sermon that will be linked below. The Israelites had seen the glory of God many times. He delivered them dramatically from their Egyptian captors, provided food and water in the desert, gave victory over their enemies many times (see the last two chapters of Joshua for their affirmations of loyalty to God). Then they kept on grumbling and forgetting God's mercies, and eventually, became subjugated by the Babylonians. Nehemiah was the cup-bearer for King Cyrus, which was not only tasting for poison, but a position of administrative responsibility. The king graciously allowed the exiled Israelites to return to Jerusalem, and Nehemiah facilitated the rebuilding of the wall. Their enemies didn't cotton to that idea, and did their best to stop the rebuilding without violating the royal decree (Nehemiah 2:19, 4:7-9). The enemies did not realize that they were fighting against God. Be aware that a component in may of the lies, both to Nehemiah and to the rest of us, involve bullying and manipulation. Biblical creationists are told that we cannot withstand the might and consensus of the heavily financed secular science establishments. People don't believe the Bible anymore in this enlightened day, so there is no point in resisting. Evolution is a fact, don'tcha know! This lie works with the first one, and we are nobodies. I have made it plain that I am a nobody and have no legacy. But I have an unregistered assault keyboard, since the web gives us reg'lar folk a chance to speak up. There are also some large creation science ministries who are supported in one way or another, especially through social media. At this writing the seventh annual Question Evolution Day is about to happen on February 12, and it has had the support of known and unknown people. Even those of us that atheists and evolutionists have decided are "unimportant" have the ability and the right to make our views known. The Question Evolution Project has less than 10,000 "Likes" on Fazebook right now, which is substantially fewer than the high-profile ministries. All creation ministries have fewer fans than atheistic entertainers and pseudo-scientists who are public figures. Dwarfing those are Pages and sites for entertainers, athletes, soft drinks, and so on. (Sciencey stuff doesn't really make the cut for a passel of people.) So what? We're being faithful to God's calling, and are not going to quit because everyone does not adore us. This child gets tired. I have a job to pay the bills, and I do creation science ministry work after hours, on vacation and holidays, and so on. At this very moment, I have eye strain. Maybe I should just take a week or two off. But I know of someone who had a ministry and got "burned out", and left it all behind with the idea of maybe coming back someday. He's been absent for years, and some people wonder if he stopped believing altogether (he says that's not the case). Sure, we need to take a break, but not in the midst of a major project. Large ministries have many people on staff to take up the slack when others are absent. That's fine, but the ministries themselves do not shut down. Don't be disunderstanding me, I'm not talking about relentless obsession and avoiding a short breather to care of daily life and ourselves. However, long-term delays can result in...nothing. I am thankful that I have help on The Question Evolution Project. There are some narcissistic tinhorns who make it their purpose and seek validation by attacking biblical creationists (and other Christians) on the internet. Somehow, they have decided that lying, misrepresenting, destroying, and other things are "good". How can such activities be good? Because the end justifies the means, mein Herr. They seldom engage with the actual content, and seek to destroy people. Some go so far as to misrepresent and defame us to other creationists. I have been threatened by someone who said he was calling my workplace to have me fired because he disliked what I had said online! (Like he could just call up the head of a major international corporation who wouldn't care anyway.) Others have attacked TQEP and tried to get it taken down by Fazebook, as well as setting up fake accounts of FB Pages, creationary individuals, and so on. What would that prove? Would it prove atheism or evolutionism right? Would it mean there is no God? Not hardly! It would only prove that someone had a tantrum and sabotaged people they wanted to silence, which is censorship. Read the end of Revelation: God wins, and his people are with him. People hate us. We cannot hide behind a watering trough, squeezing off pot-shots at bushwhackers. We have a job to do, and the results are in the hands of God. He is the one we want to glorify, after all. Atheists and evolutionists like to recruit others to attack biblical creationists en masse. Usually, they reside in their holes and share ego-bolstering stories and libel about how creationists are "anti-science" and oppose "reason". Ironically, those people display little logic and a great deal of hatred for the truth of God's Word (1 Corinthians 2:14, 2 Corinthians 4:4, Matthew 12:30, Romans 5:10, Romans 8:5-6, Psalm 14:1, Proverbs 1:8, Romans 1:18-23). Misotheists have attacked God's Word for millennia, and the Bible still stands strong. We have to believe and apply it. This is a lie that resonated in my own spirit, as I believe that not only Satan has "spoken" it to me, but also his hand puppets have said it as well. I pray that I'm seeking glory for God, not glory for Bob. But I still wonder if it is this ministry is monument to my ego. Is it an idol? Someone who threatened to destroy The Question Evolution Project ridiculed a post I had made, and apparently ignored the content (they do that). In it, I had said that TQEP is in God's hands, and that I had almost taken it down myself! The insidious part of such an accusation for a sincere Christian is when we ruminate if it is true after all. Guess what happens? We end up focusing on ourselves instead of going about the work that we were called to do. Someone who has vowed the destruction of you or your work wants to be your friend? That'll be the day! (It's interesting that some people who have antipathy toward me, creation science, the Bible, and God himself address me like we're great buddies and co-workers riding fences together.) Atheists have invited me to be on their Podcasts, attempted to bully me into participating on forums, and other things, but I know full well that they were disingenuous at best. Secular news sources have falsely reported on major creationary ministries such as Ark Encounter. Time and again, they act all friendly like, then spin the news — Just ask Dr. Jason Lisle. No, there is no reason to take worldly counsel from enemies of God, nor to give in to their manipulative machinations. The Ninth Lie: Danger is coming. Run away! Run away! Similar to the Sixth and Eighth lies, this is when someone is pretending to be interested in your welfare and safety. If you've been grounded in God's Word and have been staying faithful, you should be able to spot nonsense quite easily. Now, let's go down a side trail for a few moments. I tend to do that, don't I? Flip back in your Bibles a few books from Nehemiah, to 1 Samuel. In the 17th chapter, we find the famous account of David and Goliath. The giant was taunting the armies of Israel. David was making a food run to his brothers in the army, and heard this blowhard. He asked, "Who is this uncircumcised Philistine, that he should defy the armies of the living God?" (I Samuel 17:26). Savvy that? He wasn't making a crude remark about man parts, but was reminding Israel that they had a covenant with the Creator, not the Philistines. Later on, David and Goliath had words (1 Samuel 17:43-47). Goliath was taunting, but David was affirming that he was God's property and under God's protection. When it was time to commence to fighting, notice in 1 Samuel 17:48 where David ran toward that heavily-armed, armored, bravado-filled giant. And won. Back to the main trail again. We belong to the Creator of the universe, who died for us, defeated death by bodily rising from the grave, lives in us, and is going to take us home with him. He has the final victory, and God is sovereign. We don't run from real or imagined ministry "danger", we run toward it in full assurance! Nehemiah never wavered, he had a wall to build, and the Sanballats of his world did not prevail. From CMI, "BioLogos misreads Jesus on the age of the earth"
From AiG, "Jesus Devastates an Old Earth"
Some people seem to think that we can wait for compromisers to use the "wisdom" of atheists to interpret what the Bible says and means. They are actually calling Jesus, Peter, Paul, Moses, and the rest dishonest or uninformed. What we really need to do is stand firm on the Word of God and in the armor described in Ephesians 6:10-18. Nehemiah had a wall to build. We have our work to do as well, despite attacks and lies from secularists and religious people. I hope you'll listen to "The Nine Lies", free to listen online, and you can get a PDF of the sermon notes as well. If'n y'all don't want to listen at the computer, here is the direct MP3 link.